Former Sterling Heights Stevenson standout and current Kansas City Chiefs LB Frank Zombo addresses Stevenson football players at a jersey ceremony in Sterling Heights on Thursday, Jan. 26, 2017. Video by Chris Nelsen, Special to the DFP. Frank Zombo understands the risks involved with playing football. While ankle sprains and knee injuries have always been a threat, a more serious concern has emerged — head injuries. Zombo, an outside linebacker who recently finished his seventh NFL season and fourth with Kansas City, doesn’t believe he’s ever suffered a serious head injury, but acknowledged the possibility of long-term brain damage. Although the NFL has disputed some research linking football to permanent head injuries, including chronic traumatic encephalopathy (CTE), nobody can deny the sport’s physical — and sometimes violent — nature. Despite the risks, Zombo never considered quitting, nor would he stop his children from playing football. Carl Davis, a Stevenson alum and defensive lineman for the Baltimore Ravens, is accustomed to blows to the head. Along with playing football since childhood, he used to box, too. Better equipment, concussion protocols and rules to prevent helmet-to-helmet contact are attempts to make football safer. Despite the possibility of permanent brain damage, football remains popular among players and fans. The NFL has come under fire in recent years for trying to discredit, and possibly conceal, scientific research showing a correlation between permanent brain damage and football. A group of former NFL players sued the league over its handling of concussions and CTE, a case settled in 2013 with a tentative agreement for the NFL to dish out $765 million to compensate victims, pay for medical exams and underwrite research. But is the NFL safer now than it was years ago? 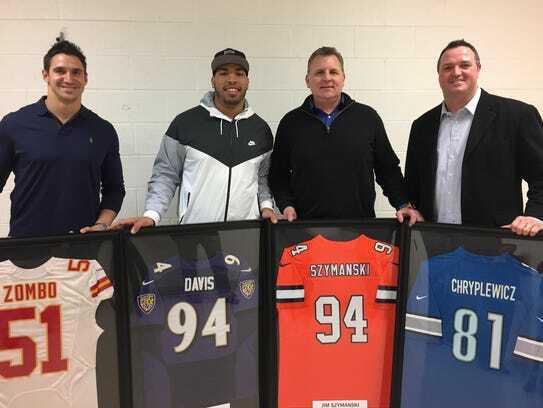 Zombo and Davis were joined at Thursday’s jersey ceremony by former Stevenson greats Pete Chryplewicz and Jim Szymanski. Former Titans Chris Liwienski, who did not attend, and Dan Jilek, who died in 2002, also were honored.